British prog rockers Midnight Sun have announced a new guitar player and temporary bassist for their upcoming UK dates. The band, who made an impact at Summer's End last year have announced former Naked Flame guitarist Ben Swanwick as replacement for the departed Tom Ennis. 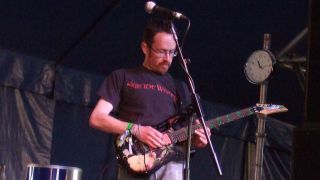 "Ben made his first appearance with the band at the inaugural Fushion Festival in Stourport and seamlessly fitted into the line up, both musically and personally," the band tell Prog. "Ben is a professional musician, playing and teaching guitar and has also done demos for a guitar pickup company and demonstrated products at the London Guitar Show. He’s a superb guitarist and we’re stoked to have him on board as a member of the band. "Ben has a deep and abiding love of metal & prog music and favourite bands include Pagan’s Mind and Devin Townsend. Under some duress, he also confessed a liking for Styper but we’re not holding that against him!" The band have also announced that former Grey Lady Down and Darwin's Radio bassist Sean Spear will guest with the band on their April live dates, as they have still not found a full-time replacement for the departed Jack Thomas. There is still no news on when the band's anticipated debut album will appear.